Hey guys! What's goin' on? Oh, nothing ... just a bad case of the dress-ups. A few days ago I was tagged in a post by Kassie of Unique Desire to take a 'Which Disney Princess' are you quiz. The challenge was to do a look based on the results. Well, I usually associate with Belle because she's my all-time favorite, but the quiz yielded a 7-way tie! So, of the 7 girls I got, I decided to do Megara from Hercules. I couldn't find any looks out there on the internet that had been done already so that was a challenge I wanted to accept. Meg really only has one look throughout the movie, she's wearing a draped purple toga with copper clasps and her makeup is really minimal so there wasn't much to go off of but here's what I came up with. And now for the fun part! 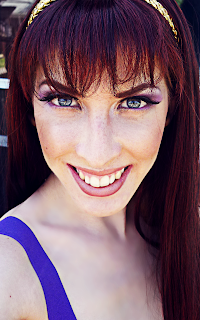 I got out my wig and some accessories and went full on Megara! Disney dress up time! 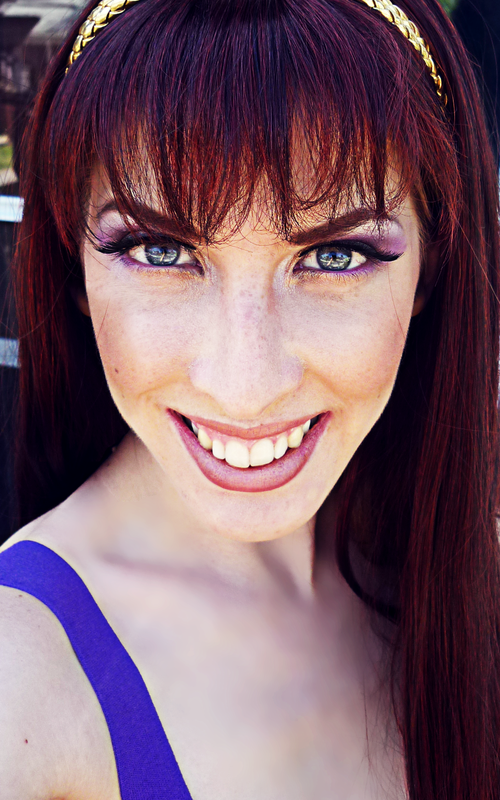 Who knew I'd make such a convincing Megara! Well, not really but I guess it was just lucky that I got drunk and ordered this ridiculous wig off e-bay a few months ago. I didn't think it would ever come in handy, and now i can say it was a worthy purchase. Besides the wig, I'd have to say my favorite part of this look is the super long, ultra flared lashes. 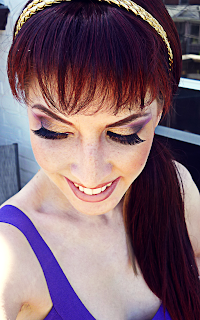 They look exactly like cartoon princess lashes that go on for daysssss. I want to wear them all the time ... in fact as I sit here writing this I still haven't taken them off. Oops! 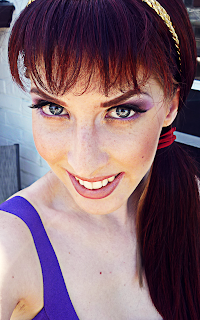 EDIT: Check out another Megara look by Fierce Nerditude or See Ruthy's Pain & Panic inspired Hercules look! 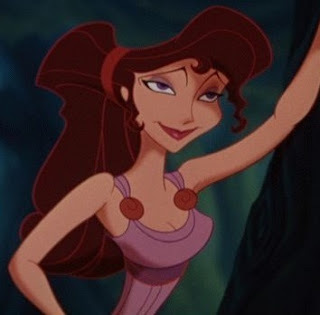 Well, that's my Megara look. If you want to take the quiz yourself to inspire a look, or just for fun it's HERE. 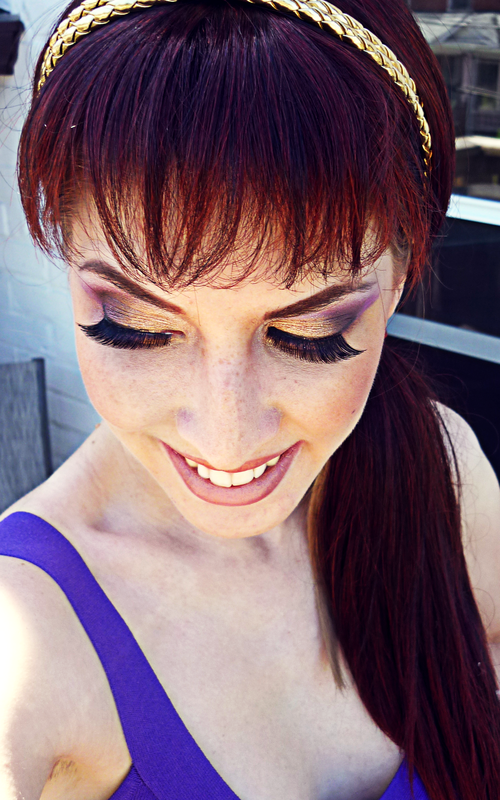 Also, Kassie will be doing a whole series of looks for the princesses so you should follow her if you're not already. That's all for me. I'm going to be away this weekend for PrideWeek, pretty much my favorite week of the year because it gives me free license to wear rainbow and glitter and be fierce, ferocious, and fabulous to my hearts content. I have an UNREAL look planned for Pride that I can't wait to show you guys so I hope it's as good on my face as it is in my head! Fingers crossed. If you're interested in the product breakdown click read more! Love you guys, stay fabulous! Well, this is the final look in my Game of Thrones series and it's the one I worked the hardest on. I designed it first, but I've spent so long figuring out how to realize my original vision that it's the last one I'm posting but I'm really proud of it and I hope you guys like it. This house is my favorite in the series, because this is the house that my favorite character, Danyerys, belongs to. 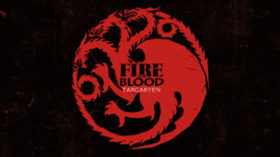 The Targaryen's sigil is a red dragon on a black background so I wanted this look to be incredibly dramatic and almost reptilian. Because the Targaryen's have a rich history of rulers and bloodshed, I wanted this look to be powerful and have huge impact. It's probably the least wearable of my looks but definitely the most fun to do. Have a look and tell me what you think. I think it's pretty badass if I don't say so myself. Here's the full face look for you guys. I was going to do crazy warrior braids to finish it off but to be honest, this took me almost 3 hours from start to finish so I was pretty sick of staring at my face in the mirror by the time I was done the makeup. I still like it though. I messed up a little on the 'dragon tears' under my eyes but I've never had a steady hand so that's to be expected. Should I continue the series or start a new one? Please let me know if you have any suggestions/requests/feedback, it would be GREATLY appreciated. Positive/negative, doesn't matter. I value the opinions of my subscribers above all else. And, as always, thanks for your support, it means the world to me! Happy Birthday to Me! I'm 24 years young today, and to celebrate I did a look inspired by my pink and purple blog layout (click picks to enlarge) as my blog is also celebrating it's one month birthday tomorrow! For this uber girly look I stuck almost exclusively to the CS Ultra Shimmer palette which I've kind of rediscovered lately. There are so many pretty colors in there it's hard to choose just a few. Anyways. I really like it and I'm going to keep it on and wear it out tonight for dinner/drinks/dancing with friends. I mean, when else can you rock turbo-purple eyeshadow for no reason if not on your birthday? But enough about me! I was fortunate enough to receive a number of awards from fellow bloggers in the past few days, and I was also lucky enough to win a giveaway so I want to give credit where credit is due and say thank you so here goes! Thank you to Lisa from All Things Lisa who had an ELF eyelash giveaway recently and I won! I'm so stoked, I've never won anything before so this is really exciting and a perfect unintentional birthday present. I have zero falsies in my stash at the moment and no money to get any more so thank you thank you thank you. Her blog is really fun and she's doing another giveaway soon when she reaches 100 readers so check her out if you haven't already. I would also like to thank Widdlesh of FACE:PAINT for being the first blogger/person ever to give me an award. My blog and I both thank you. 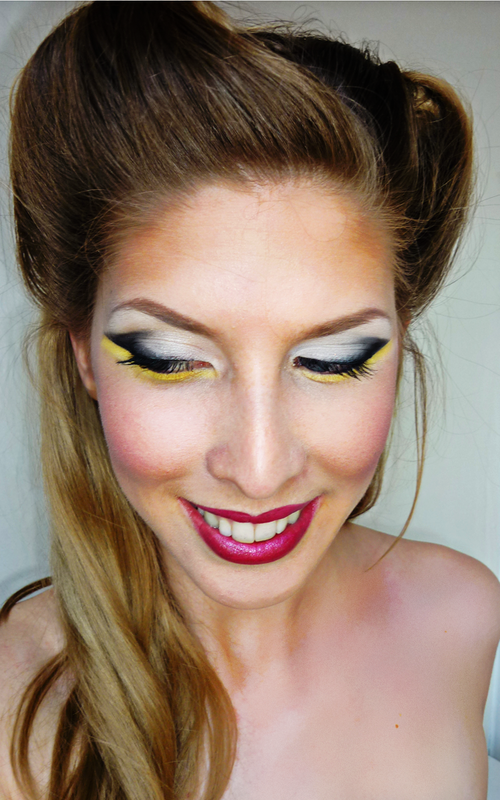 She is an incredibly talented makeup artist whos work I have admired for a while over at MakeupBee.com. (If you're not on there already, you should be!) She's always turning out super colorful eye and lip looks and I can't wait to copy cat some of them! Thank you also to the incredibly talented Kassie of Unique-Desire. She was also kind enough to tag me for a blogger award so I wanted to return the love. I think hers was one of the first blogs I ever followed and it remains one of my favorite to check. I highly recommend her Sailor Moon series of looks if you haven't already seen them. So friggin pretty. My next thank you/shout out goes to Ronnie of Bows & Curtseys. Ronnie also tagged me with a stylish blogger award and I couldn't be more flattered. Hers is a fairly new blog but I love all her looks and shes another one of my favorite bloggers to follow. She's got a Seven Deadly Sins series coming up that I'm already looking forward to so if you're not following her, you should be, more people need to see her awesome looks. What would you spend your $50.00 gift certificate on?? Seriously, it wont be back for a whole yearrrrr. What am I going to do?? Get a life?? Never! Alright, now that I'm done .gif spazzing, let's get down to business. As the series is wrapping up, so are my GoT looks. 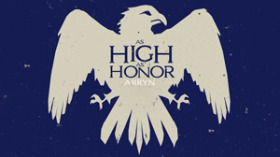 This is my second to last look and it's for House Arryn. The Arryns occupy the Aerie, a castle built 'above the clouds', so I wanted this look to be very airy, light, and fade upwards from sky-blue to ethereal white with lots of white bleeding out to the temple and under the eye. Very light and pretty. I didn't even use any eyeliner which definitely made my eyes feel kind of naked, but I think it was worth it for the look. To wrap things up I stuck some feathers in my hair for the Eagle sigil and put on some really light pink lipstick. Voila. What do you guys think? It's probably one of the more wearable looks that I've done for this collection, but that's a nice change. I really wish you could see the sparkles around my eyes but unfortunately until I get a better camera (my birthday is coming up, hint hint!) this is the best I can do. 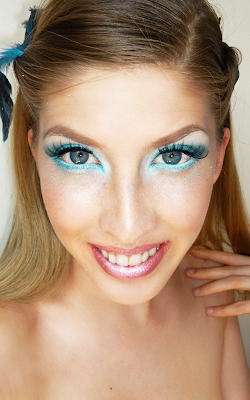 I used the Coastal Scents Ultra Shimmer Palette for this look to get the bright shimmery cyan colors I was aiming for. I also broke in my brand new liner brush and teal Sephora gel liner and I'm. In. Love. I'm never going back to liquid liner now. How have I lived like this for so long, not know the joys of gel liners. It's unthinkable! Hope you guys all had an amazing weekend and welcome to my new readers. Leave a comment and introduce yourself! 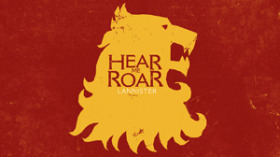 I am Lannister, hear me roar! So, here's my fourth look in the series. The Lannister Lions. 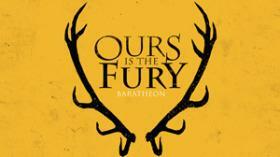 The Lannisters are a gorgeous, power hungry, ruthless clan and everything about them revolves around gold. Golden hair, golden armor, golden coins, golden crowns, these guys put Midas to shame. 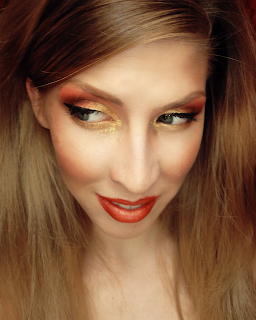 So, obviously I wanted this look to have lots of gold (gold shimmer, gold eyeshadow, gold glitter) - and to channel my inner lioness I teased and tangled my hair for about a half an hour. I'll be regretting that decision very soon but for now, take a look. I'm going to come right out and say it. I'm really disappointed with this one and I'm probably going to re-do it or re-design it. It was going so well at first and then for some reason, by the time I got to eyeliner things were smudging and running and I was losing pigmentation, the lip-color wasn't right, my hair wasn't behaving, even my camera was acting up to top it all off every picture I took was ... less than flattering. Essentially, everything went to hell in a handbasket (one of THOSE days) so this is the only half decent shot I could get of it. It reminds me of a look I did almost a year ago and I think I like that one better anyways but you can decide for yourself. Anyways, more importantly, something that DID go well recently ... 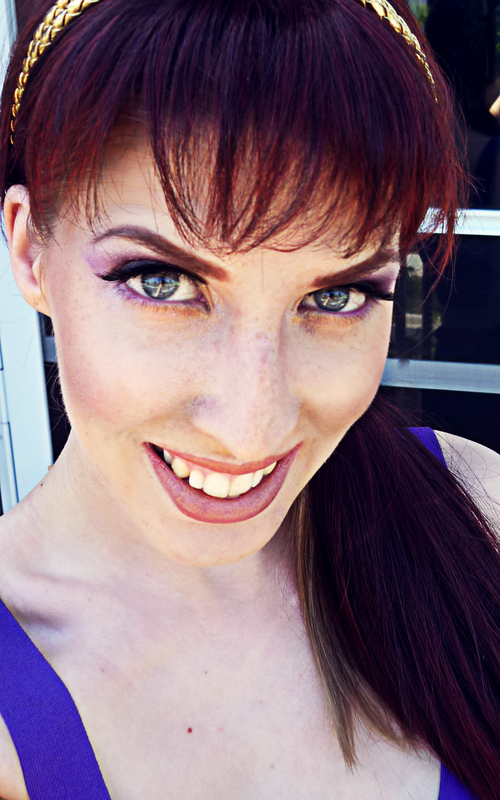 I redid my blog! I was inspired by Kassie's redesign of her amazing blog Unique Desire (check it out, it's so cute and she's super talented) and I wanted to make mine look a little bit more professional and also make it easier to navigate. Tell me what you think; your comments and critiques mean a lot to me. Also, one final thing, a big WELCOME to all the new readers I've acquired in the past few days! Wow! From 28 to 43 in like four days. My birthday is coming up in a few days so this is the best birthday present ever. Maybe I'll do a birthday giveaway to show my appreciation for all your support. What kinds of things do you like to get in giveaways? I LOVE how she did her eyelashes to mimic the shadows and the grass! Lion King's Pride Rock: Look at the detail in the tiny animals! Alice in Wonderland: All drugstore brand products (apparently). WTF??! Wow. Just wow. This girl deserves all the respect she gets. What do you guys think of her work? Would you consider it true makeup? She says herself she can't have her eyes open, so it's more like eyelid art. Thoughts? Either way, very very talented. Anyone up for the challenge of trying sometime like this themselves? I know I couldn't even draw/paint this stuff on paper let alone my skin. Hope you guys enjoyed the post and look for my next look to be up in the coming days. I've been really busy working for a wedding decor company and the hours are really nuts so it's been hard for me to do looks and post them. But I will have some INCREDIBLE shots of the most beautiful Romeo & Juliet wedding that we just did recently. 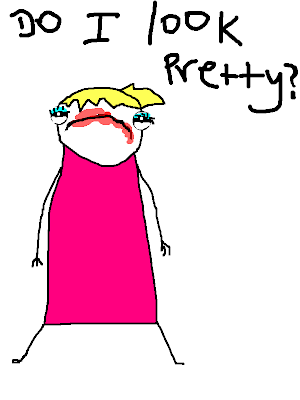 I'm going to go eat the leftover cake the bride gave me. Jealous? You should be! Haha. Bye y'all. Anyways. It finally cooled down a bit and I managed to put together my next look of the series. This is a really sultry, smokey (but sparkly) black and silver look to emulate the colors of the crest as well as the mysterious, wintery, dark feel of Winterfell where the Starks hail from. Check it out by clicking the pictures to enlarge. 10. 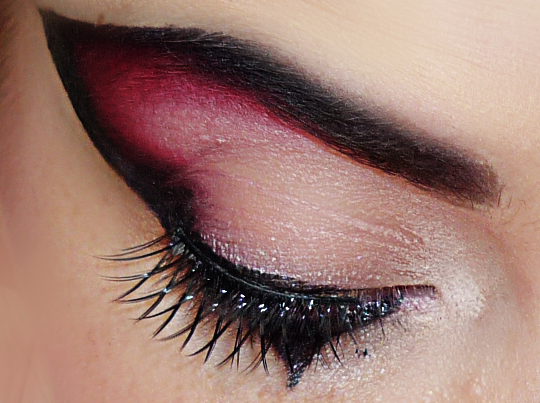 Line upper lashline & lower waterline, add mascara and voila! Looks kinda like Black Swan makeup?? This look is really dark for me and makes me look really pale so I don't think it's very flattering but I like how dramatic and sultry it is. 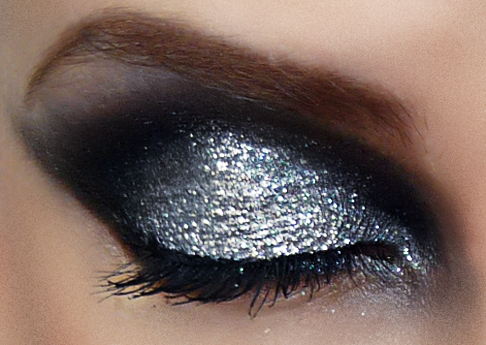 I envy girls who can pull off ultra-smokey eyes. 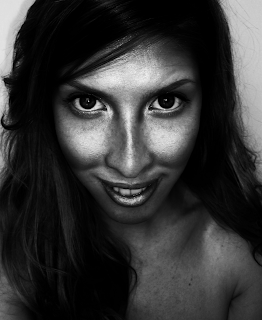 I end up looking somewhere between a slutty raccoon and Disney villainess. Well, I'm off to spend the whole weekend trying to clean glitter off my makeup counter. Sunday night means only one thing at my house. Game of Thrones! So in honor of tonight's new episode, I've completed the second look in my GoT series. While my last look was a very literal interpretation of the house crest, I definitely took a little more creative license with this one. My inspiration was the pointy stag horns, so I started with that and then smeared yellow underneath to give it a more interesting and edgy look. So this is where the similarities to the crest end and the creativity began. I have been dying to try this tutorial from Diary of a Vintage girl to see if I could actually do it and also to see if I could pull it off. 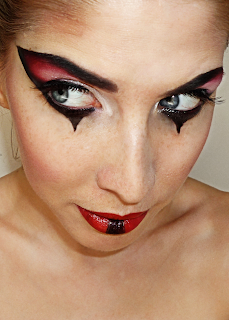 It was pretty tricky to get right and I would never wear this look out of the house but it was fun to take pictures of! What do you guys think? So retro! (Click to enlarge). I finished everything off with a magenta lipgloss to contrast the yellow in the eyes which made the look a lot more colorful and quirky than I originally intended. I can't decide if the different elements contrast in a good way or make me look like I'm having a styling identity crisis!? Leave your thoughts in the comments and hopefully I'll have the next look in the series done sometime in the next few days. Hope you guys had a good weekend! Rollcall! Is anyone else watching HBO's Game of Thrones?? My boyfriend Barrie and I have been obsessed with it ever since it's aired and have gone on to buy the books as well. Needless to say, I'm a little bit addicted. 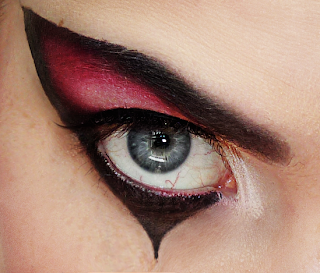 So addicted that I decided I wanted to do a series of makeup looks inspired by the six major houses (so far) featured in the show. 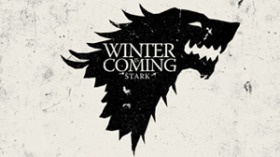 House Stark, House Lannister, House Targaryen, House Baratheon, House Arryn, and House Tully. 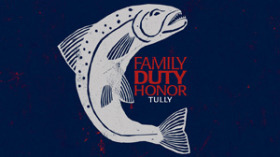 For my first look, I wanted to do House Tully. The crest is a brown/blue riverbed with a silver fish and so I wanted to represent the river's alternating colors with a double cut crease. 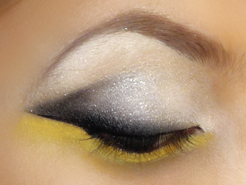 I was really skeptical about doing this look at first, but in the end I was really pleased with it! It makes my eyes look so much bluer than they actually are and the double cut crease doesn't look nearly as cray-cray as I thought it would. I wanted the look to have a ruddy, earthy feel so for the rest of the face I used a browny-pink lipgloss from Sephora and lined my lips with a light sandy brown pencil from NYC. 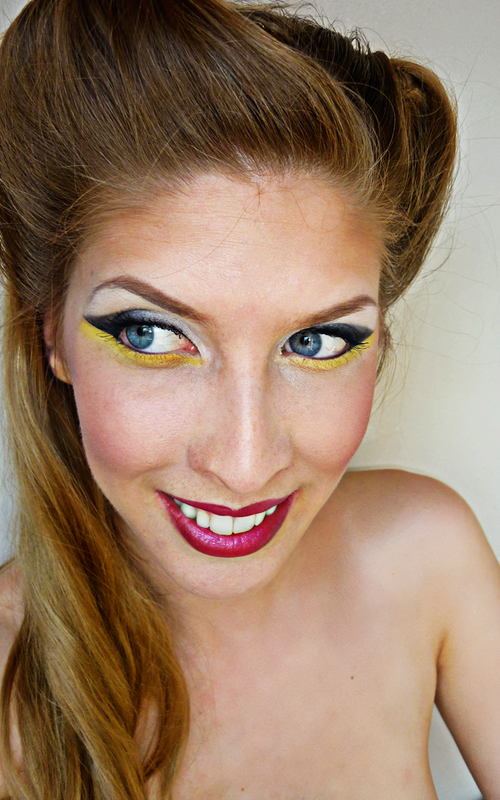 I lined the eyes with a brown liquid liner and used Sephora's Sculpting disk for the definition of the cheeks and temples. I finished the whole look off with a Heidi style milkmaid braid which was super easy to do. Split the hair into two low pigtails, braid and when finished, pull the tails up to the crown of your head so the ends meet and bobby pin to secure. Voila, Swiss Miss chic in two minutes flat. I'm looking forward to sharing the other five looks with you guys in the coming days. Let me know what you think and if anyone would like more information or a tutorial or whatever just let me know. I'd be more than happy to oblige any requests. If you compare the shades of my face to the shades of my shoulder you can see the difference a little bronzer can make! 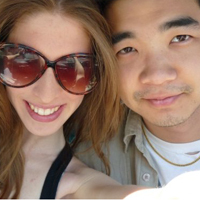 From pale to perfection! I've included a black and white comparison picture to give you an idea of where my dark brown bronzers went (under cheekbones, forehead, bridge of nose, neck, perimeter of face) and where I put my peach and gold highlighters (apples of cheeks, above brows, center of lips). Avoid orange based bronzers - you want more golden ticket than oompa loompa! I used Coastal Scents 26 Blush Palette to shade my whole face, plus a little bit of Solarbeam Gold Dust from Annabelle as a highlighter. I blended everything out at the end using Revlon's Finishing Powder. So, now it's your turn. I would love to see others' interpretations of the 'less is more' makeup look!